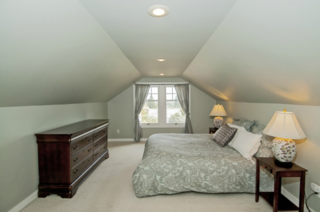 Casework transforms a humdrum attic-level master suite into a stunning, modern space with a nursery to welcome a family’s newest member. 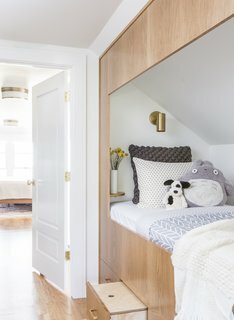 The home’s owners Erik and Julia reached out to Casey Keasler, founder and creative director of Casework, with a straightforward request for an efficient new master bedroom, ensuite bathroom, closet, and nursery. 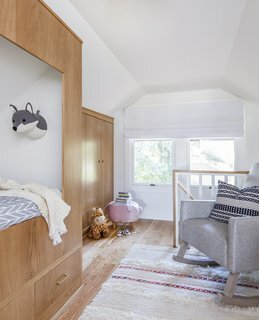 They wanted to update the finishes and create a clean and modern space that would be beautiful yet practical for day-to-day living with a young child. 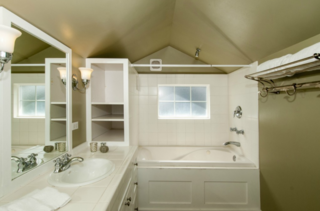 "The ceilings were low, and with the pitched roofline, most of the space wasn't usable. Incorporating all items from their program was difficult, as many items had to perform double duty," says Keasley. 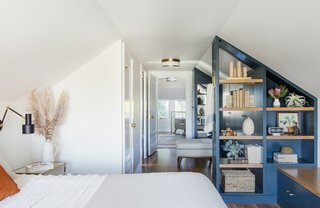 Keasler had to find a way to include four distinct spaces—a master bedroom, master bathroom, master closet, and nursery—within a compact, 550-square-foot space underneath a pitched roofline. The angled roof made it challenging to add all the storage components while still keeping the floor space open. 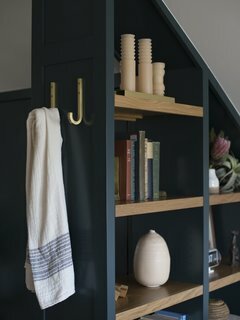 "We brought in a deep blue-green, Benjamin Moore, Miramichi paint to add a richness to the space," says Keasler. 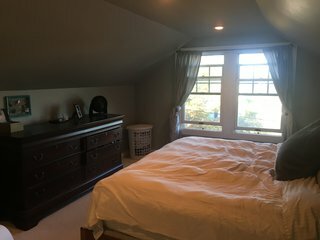 The master bedroom is open to the dressing room, but visually separated from it by an open bookcase. The former hallway, which was extremely wide, now serves as a dressing room. Instead of closets with doors, Casework created cabinets for clothes and shoes. 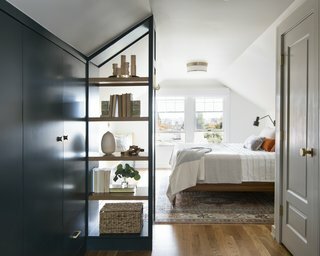 The light-filled master bedroom offers a mix of closed and open storage. 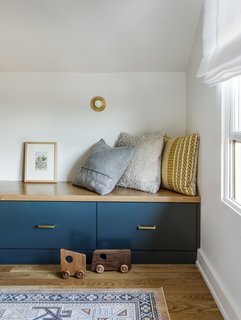 "We extended the cabinets as a bench from the dressing room into the bedroom. You can’t walk along this section because the ceiling is too low, but it's high enough to sit on a bench and take off your shoes at the end of the day," says Keasler. 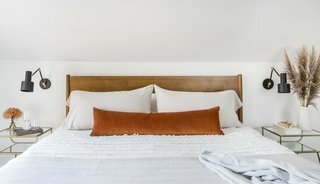 The king-sized bed and end tables are from West Elm. Keasler kept the color and material palette mostly neutral so that the space would feel timeless. Rich blue-green elements balance out the simplicity of the oak cabinets and floors. Casework incorporated wall sconces instead of table lamps to save space. "In the beginning, we looked at many different floor plans to maximize space. We even explored adding a second dormer, but in the end, we realized this wouldn’t add that much additional square footage. So we worked on creating compartmentalized storage, much like what you would find in an RV, where everything has its place," says Keasler. A shelf wall in the sleeping area. The design team moved quickly so that the nursery would be ready in time for the baby’s arrival. 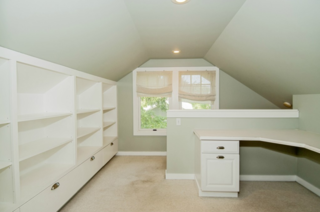 Casework transformed the home's office into a nursery. The nursery is located where an office used to be. Keasler and her team removed a partial-height wall at the stairs and added a railing to increase transparency and let in more natural light. 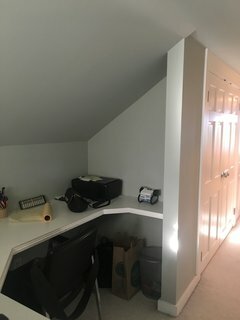 The formerly unused space along the pitched roof now features a built-in closet and bunk. Pull-out storage is located under the bunk. The bench has drawers for seasonal items. 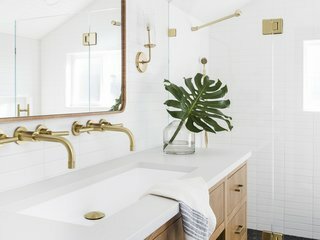 The bathroom follows the same clean and timeless palette as the sleeping area and nursery. Casework swapped the old raised tub for a new shower with a tile wall that extends over the pitched ceiling of the dormer. There wasn’t enough space for two separate sinks, so Casework incorporated one large sink with two wall-mounted faucets to save counter space. Because they were working with a modest budget, Casework left the bathroom plumbing fixtures in their original locations (aside from the showerhead). The vanity rests on legs, giving the small space a light aesthetic. A large mirror mounted horizontally on the wall is flanked by sconces at eye level. 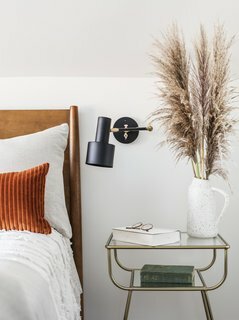 Sconces and decorative wall lights add a touch of understated glamor. 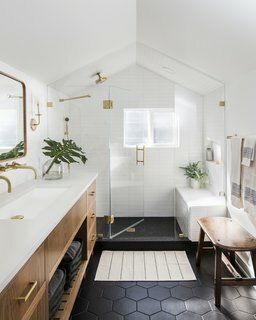 "It was all about balancing the closed and the open, the heavy and the light to make this low-ceiling-height space functional, but also open, cozy, and bright," says Keasler.